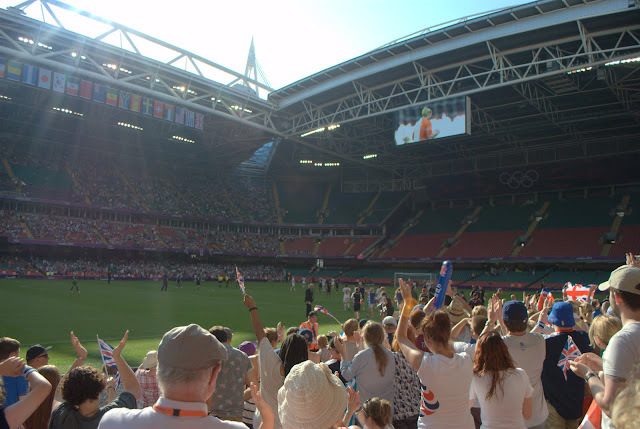 In another late series of posts, I’m looking back at last year’s magnificent summer centred around the London 2012 Olympic & Paralympic Games. 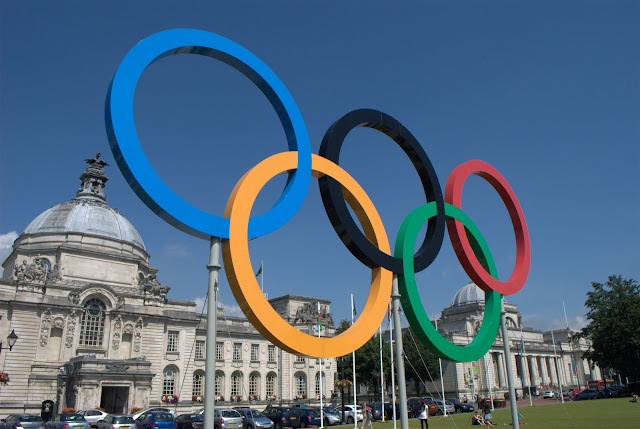 My first trip of the Olympic summer would be to Cardiff to meet two friends. 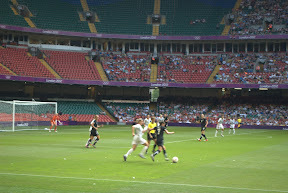 We had tickets to see the very first event of the London 2012 Games: women’s football, GBR vs NZL at the Millennium Stadium. Other games would kick off an hour later. 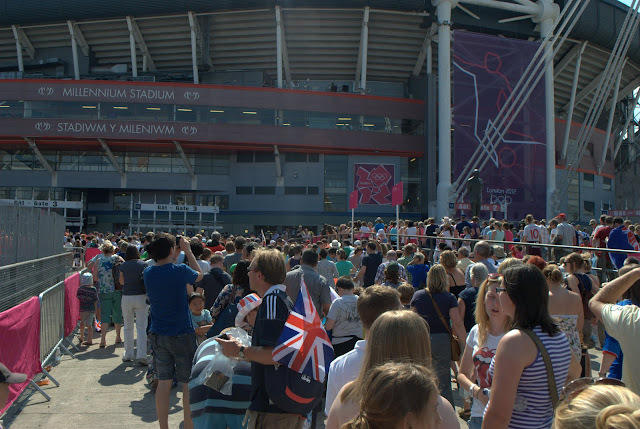 This was taking place two full days before the Opening Ceremony just because the normal Olympic window is a little too short to fit in both men’s and women’s tournaments, and you can’t go beyond the Closing Ceremony! 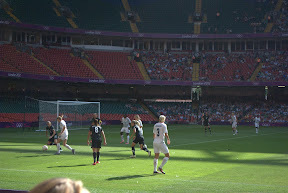 Our little group had an interesting dynamic: 1 English (me), 1 Welsh, and 1 New Zealander with a Welsh family history – Amy the Kiwi had spent years saving up to come over to see the Games, when the opening game was announced as GB v NZ to be held in Wales, it just had to be done. It was also among the cheaper and more available tickets so there was no excuse not to! Those who know me know I’m not a big fan of football, I watch the odd major competition but I thought this one would be different, it could mark the breakout of the women’s game into something bigger, and what’s more I can always say I was at the opening event of the London 2012 Games! All that was to come in the afternoon – first we had some sightseeing time. I took the train up, which was fairly painless but time-consuming as I’d chosen to take the cheapest ticket available (needed to pay for the Spanish holiday too!). I spent a bit of time on Britain’s rail network this summerso I may follow-up with a post about my findings. Needless to say, travelling miles through cuttings and a tunnel isn’t as grandiose an entry to Wales as either of the Severn Bridges. But still, I arrived bang on time – and in a quirk of fate Amy’s train arrived at precisely the same minute so we met on the platform. We’d meet Luke shortly afterwards. We had four or five hours to spare before the game. Amy went off sightseeing with a local relative, leaving Luke and I to wander around the city. He’s only up the road in Newport so this is all old hat for him but for me Cardiff was new – I’d been to big music events before but not really expored the centre of the city, it was a case of pub/restaurant then straight to the venue. As it turns out it reminded me a lot of Exeter which I visit fairly often, a very similar style of place with green space and a big shopping area alongside a ridiculously old building – in Exeter you have a cathedral and in Cardiff you get a huge castle, the difference is the Welsh charge a lot to get into the castle.. so we didn’t bother. 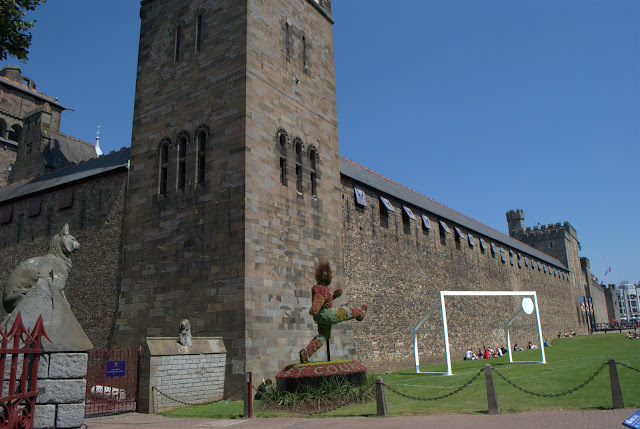 I have to say I loved the sporty art piece outside the castle walls by the park! We also found City Hall, which was quite an impressive building, though I was much more excited about the giant Olympic rings in the grounds! Olympic fever was starting to build! Further around the city there were a lot of Olympic banners in the streets as well as a big screen, and some entertainers for the kids. 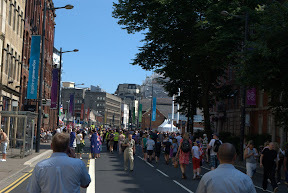 The other difference is Exeter doesn’t have a colossal stadium rising over the city streets. Strangely though the city felt very quiet, like a normal weekday afternoon with everyone busy at work, or perhaps even quieter. It was a gloriously hot sunny day, a bit too hot at times if I’m honest and easily comparable to some of the days I’d had in Spain, though nothing like the last two days there. It was still necessary to find cold drinks, then we met Amy and her cousin and wandered through the park to a nice pub, with even nicer cold beer and a good meal. Perfect. Soon it was time to head to the stadium. When we approached the stadium we finally found all the people. 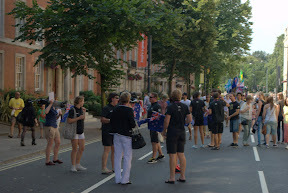 We even saw members of the NZ Olympic Team on their way in to support their teammates! They seemed to come from nowhere and were all heading for very long queues at all the entrances. We were warned about this, due to the extensive security checks access might take a while. And the checks were quite extensive as the list of banned items was long and actually quite unneccesary – no different to modern airport protocols with the limits on liquids in clear containers. Since I was taking a train to London that night to stay at a friend’s place it was annoying that I couldn’t just bring normal shower gel, toothpaste etc., I had to bring little travel packs. It fooled us into thinking the stadium would be packed, as it turned out it was only a quarter full and the security checks had kept everyone waiting. The crowd size was disappointing compared to the capacity of the stadium. 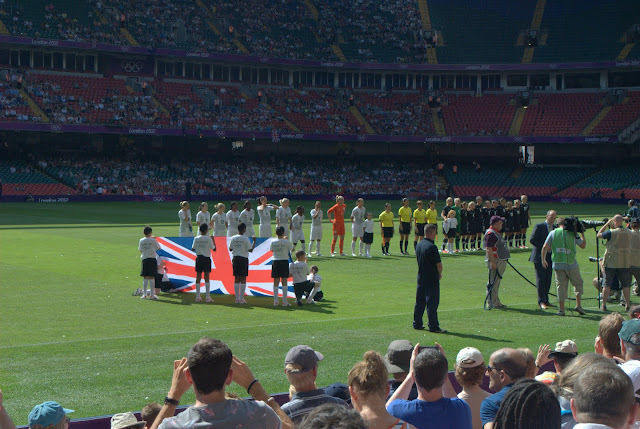 I know women’s football doesn’t have the profile in this country but then neither do a lot of other sports, and in reality a 20,000 – 30,000 crowd was already very respectable for the women’s game in this country. It just looked empty in a 90,000-seater stadium. Later we’d discover this was only part of a trend – the preliminary rounds of several sports failed to sell out. Once the tournament got to the later stages ticket sales improved such that at the final of the women’s game, Wembley Stadium was completely filled! Once we sat down we discovered something brilliant – we had amazing seats! This despite going for the middle of the price range. 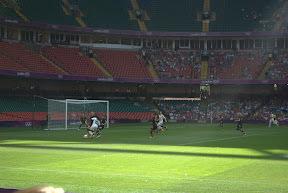 Row 9, halfway between a goal and the halfway line. I’ve never attended a football match before but it was very clear this game attracted a different crowd to the stereotypical boisterous lager louts chanting insults at the players and officials. I’m sure not all games are like that but this game was far more family friendly. Lots of kids in attendance and lots of women. It also struck me as being more ‘middle class’ than you might expect. There were plenty of knowledgeable folk there but it still felt a bit like the Fast Show sketch with the guy not having any idea. ‘Is that good?’ Maybe that was just me. The chanting was also amusingly half-hearted, a quiet ‘Gee B (clap clap clap) Gee B (clap clap clap) Gee B’ mumbled around the stadium. Almost like everyone was looking round asking.. ‘is that right? Is that what we do?’ Despite being united under the UK we’ve had over 150 years of playing ball sports as separate nations of England, Scotland, Wales, NI.. now people were trying to work out how to chant for Great Britain and I found it quite funny that people seemed not to know how. It also sounded like they completely stole it from the NZ fans (and actual NZ Olympic team) who’d been cheering ‘Kiwi, Kiwi, Kiwi’ in the same tones but more enthusiastically. Anyway the GB fans got louder as the game progressed especially when we took the lead. The game itself was good, they were closely matched teams. 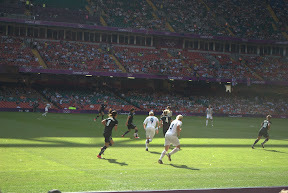 GB put a lot of pressure on NZ who held off the attacks well and made a few of their own. Goalless at half-time, GB eventually took the lead from a free-kick to score the only goal of the game – the scoreline not really reflecting the game. While there were moments of calm it wasn’t just a case of kicking from one end to the other, both teams were taking shots. On the whole it was a good advert for the women’s game which had long been thought of as a second- or third-rate amateur sport in this country, perhaps rightly in the past but unfairly for the past few years perhaps, and that’s strange for a football-obsessed UK. Nowadays the standards are far higher than before and I’ve definitely seen several lower quality matches in the men’s game. This is a double-edged sword for me, because although this equality in sports is long overdue it will lead to even more football on our screens and there’s plenty of it already! It was interesting on another level too because I realised how fast and fit a football player actually has to be, you don’t really appreciate that when watching on TV. Crowd celebrating a GB win! Both teams did a lap of honour which was good to see. 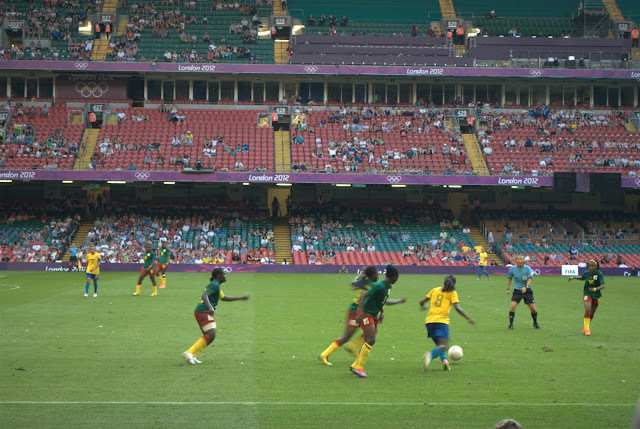 There was another reason to go to Cardiff – the first rounds of the women’s competition featured two games per day and our second game was Brazil vs Cameroon! A classic World Cup match-up in the men’s game, surely it promised much for the ladies too. This game was immediately more alive than the earlier one, more attacking and flowing particularly from the Brazilians as you might expect. The fans were much noisier too, drums and everything! The Brazilians were actually dominant and were 3-up by half time, going on to win 5-0. Much like the men’s team even when they’re ahead they’re a pleasure to watch, seemingly doing things the other team(s) haven’t even thought of. Alas, we had to leave during the second half. We had a train to catch to get to London (Amy and I) and First Great Western in their infinite wisdom elected not to run extra trains late into the evening to cover the event. We either had to run the risk of getting the last train along with everyone else in the stadium and it being too full, or we leave an hour earlier and miss some of this game, which is what we did. Disappointed, I was regretting it all the way to the station when we met a long, long line of people.. suddenly it looked like a great idea! We weren’t even sure we’d get on this train there were so many. Eventually we crammed on to a train, standing room only until some 45 minutes later, not at all comfortable wearing a bag I had no room to remove. On the whole an excellent day, despite the issues with transport and the worries I might get bored at real life football, I didn’t and I have no regrets at all. The next day, Friday, would be for meeting friends in the evening. Before that, it was all about taking the opportunity to enjoy the experience of being in London during the Games, and seeing the Torch! That’s in Part 3. This is part 2 of my series on the London 2012 Olympic & Paralympic Games. The stupidly long security queues had me worried but it turned out I never saw anything like that again for the next two weeks. I’m glad I got the worst queuing day over and done with first! It was a really good day. Although I can’t remember the last time Cardiff was so hot!